Gunnerside Beck, some four miles in length, runs between Rogan's Seat (2204 ft.) and Water Crag (2186 ft.) in Upper Swaledale and tumbles down a deep romantic gorge in an untutoured chant of unfettered existence, joining the River Swale a few hundred yards below Gunnerside Village. In its short journey it passes the derelict Old Gang lead mines, which, in the last century, were regarded as some of the oldest and most profitable workings in England. It runs through a wood thickly populated with hazel and silver birch trees, the haunt of dragon-flies which abound in great numbers, hunting in their apparent appointed spaces above the sparkling water. Young trout abound in thousands and it is a pleasing sight to watch them from the village bridge taking flies that drift or float on the water. But this is a summer scene: in winter, at times, the beck is frozen solid, the hazel and silver birch shorn of their leaves are sere and bare, and the scene at the eerie lead mines is one of desolation. The wind driving from Rogan's Seat and Water Crag adds to the bleakness. Gunnerside Village built as it is of local materials - cottage, pub, post office and the boundary walls of the fields - all harmonize with the landscape woven into a crazy pattern. There is no railway at Gunnerside, or even in Swaledale, and the mail comes from Richmond, twenty miles away, by official motor van. 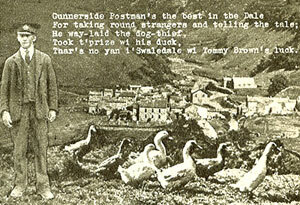 One of the best known men in Swaledale is Tommy Brown, Gunnerside Postman, who, for twenty-five years, six days a week, rain, snow, hail or blow has walked over ten miles up hill and down dale, delivering the mail to the farm steads on Crackpot Side and Jingle Pot Edge, part of the lower Pennine range. The snow lies deep in Swaledale during the winter months, but if the mail van can get through to Gunnerside, Tommy has never been known to fail to complete his full but arduous daily round. For weeks each year, at some of his calls on Jingle Pot Edge, he is their only contact with the outside world. The route he follows is mostly tracks originally used by the lead miners of bygone days who while wending their way to work, are reputed to have knitted socks as they walked in single file. In the severe winter of 1947 he saved the life of a man who, owing to strain and fatigue, had sat down in the snow to rest and was in grave danger of being frozen to death. He was found by Tommy on his daily round and taken to the nearest farmhouse, when he recovered after taken a stimulant and resting in front of the spacious open fire. His capture of the dog thief is well known in Swaledale and he told me in detail how a stranger was enticing the sheepdogs away from the local farmers and making a handsome sum by selling them to farmers in neighbouring dales. Tommy, first and foremost, is a postman, but he has other interests. He is a naturalist, and quite recently broadcast in the programme "Journey through Swaledale" with Wilfred Pickles. His post round is his hobby, but as a spare-time occupation he has been very successful in breeding and showing ducks at the local shows. Swaledale, and particularly Gunnerside, is beautiful during the spring and summer months, but in the winter the elements are severe, although, no matter what the weather is like, the local postman still carries on as usual. When next I hear of a hiker boasting of his walking prowess, I will tell him stories of the Postmen of the North Yorkshire Dales, the daily distance they walk and the heights they climb, all part of the normal day's work, and particularly will I tell him of Tommy Brown, the Gunnerside Postman, and one of the best-known men in Swaledale.